Tater tots (which are put under many different labels outside the US) are a food made from potato that had been grated and then deep-fried, often served as a side dish. They are recognized by their compact cylindrical shape and crispy colored exterior. The term is a registered trademark of Ore-Ida (a division of the H. J. Heinz Company, L.P.), but it is often used as a generic term. The product was created in 1953 when Ore-Ida founders F. Nephi Grigg and Golden Grigg were trying to figure out what to do with leftover slivers of cut-up potatoes. They chopped up the slivers, added flour and seasoning, then pushed the mash through holes and sliced off pieces of the extruded mixture. The product was first offered in stores in 1956. Originally, the product was very inexpensive. According to advertising lectures at Iowa State University, people did not buy it at first because there was no perceived value. When the price was raised, people began buying it. Today, Americans consume approximately 70,000,000 pounds (32,000,000 kg) of tater tots, or 3,710,000,000 tots per year. "Tater" is short for potato. The name "Tater Tot" was created in the mid-20th century by a member of the Ore-Ida company, and soon trademarked. In some regions, the term "tater" is dropped, and the snack is informally called "tots". In the United Kingdom, Ross Frozen Foods once produced "oven crunchies" which are no longer available. In Canada, McCain Foods Limited calls its line "Tasti Taters". Cascadian Farm calls its line "Spud Puppies". In the United States, tater tots are common at school-lunch counters and cafeterias. They are also sold in the frozen food sections of grocery stores. Some fast-food restaurants also offer them. The supermarket chain Safeway Inc. sells a generic brand of tater tots known as "Tater Treats". Sonic drive-in also features tater tots on their regular menu; available toppings include cheese and chili. Sonic also sells "Cheesy Tots", coin-shaped tots that contain melted cheese and potatoes. Several restaurants in the Pacific Northwest offer a nacho version of tots ("totchos"), covered in nacho cheese sauce and toppings. Totchos were invented by publican Jim Parker in Portland, OR. Some Mexican-style fast-food restaurants offer seasoned tater tots: Taco Time and Señor Frog's call them "Mexi-Fries", while Taco Bell used to sell them as "Mexi-Nuggets" and "Border Fries". Taco Mayo in the Southwest offers round disc-shaped tater tots called "Potato Locos." Taco John's also has coin shaped tots called "Potato Olés". 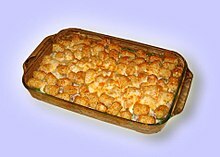 In the Midwest states, tater tot hotdish is a very popular soup-based casserole consisting of tater tots, ground beef, and various vegetables. In some areas of the Northeast, however, they are often called "juliennes" or "potato puffs". In the Midwest states, tater tot hotdish is a very popular soup-based casserole consisting of tater tots, ground beef, and canned soup. Tater tots are referenced in the film Napoleon Dynamite, the jailhouse reality-TV show 60 Days In and the theme song for The Weird Al Show. They are also a curiosity mentioned regarding terrorist Ted Kaczynski, being inventoried with his possessions at a remote cabin. In Australia and New Zealand, they are known as "potato gems", "potato royals" or "potato pom-poms". The New Zealand Pizza Hut franchise offers "Hash Bites" as a side dish, available alone or with an aioli dipping sauce. ^ a b c "Ore-Ida Fun Zone – Fun Facts". Ore-Ida. ^ a b Lukas, Paul (November 1, 2003). "Mr. Potato Head – A Dirt-Poor Farmer Turned Spud Scraps into Gold". CNN Money. Retrieved May 1, 2012. ^ a b "The Francis Nephi ("Neef") Grigg Papers". University of Utah Library Special Collections. ^ Elliott, Stuart (2014-08-25). "Ore-Ida Campaign Focuses on Authenticity of Tater Tots". The New York Times. Retrieved 2016-05-14. Tater Tots became successful enough that the brand name grew to be synonymous with the product, a delightful dilemma shared with other brands that pioneered a product category, among them Band-Aid, Kleenex and Xerox. ^ "Culinary Corner: The Fries Have It". WSOC-TV. Archived from the original on April 3, 2009. Retrieved February 8, 2009. ^ a b c Fast Food and Junk Food: An Encyclopedia of What We Love to Eat: An ... - Andrew F. Smith. p. 695. ^ "tater". Merriam-Webster. Retrieved 21 March 2019. ^ McKinney, Kelsey (28 August 2017). "The Tater Tot Is American Ingenuity at Its Finest". Eater. ^ "Jim Parker, beloved Portland publican who invented the totcho, has died". ^ Better Than Homemade: Amazing Foods that Changed the Way We Eat. p. 110. ^ "If High Tech's Bad, What Was He Doing With Tater Tots? ".